Welcome back! This week, I’ll be returning to the topic of exhibitions and transportation. Bus Tours were discussed in detail in Issue 1 and Issue 2 of this blog column. This week, we look at SHUTTLES. Unlike the Bus TOURS, shuttles run a continuous loop and you can hop on and hop off at any time. Spend as long as you like at each stop! Just remember, the bus does NOT wait for you, so when you leave the gallery or museum, don’t worry if there is no bus sitting there, they do stop regularly. Here’s a PRO-TIP: Ask the driver for the approximate drive time of a complete loop and how often the shuttles leave the convention center (frequency is based on total number of ticket sales for each shuttle). With that information, you can predict approximately when the shuttle bus will be returning to each stop! Then you can more carefully plan your time at each stop and maximize your efficiency! There are 4 separate shuttle options, and tickets are only $20 before the conference ($25 on-site) All shuttles run on Wednesday, leaving the conference center at 10:00 AM (from the Sabin Street side). The final bus for picking up from galleries will leave the convention center at 5:00pm. The Shuttle for Route A will also run Thursday evening for receptions from 5:00pm-9:00pm. The Shuttle for Routes C & D will also run Friday evening for receptions, also from 5:00pm-9:00pm. Tickets for the wednesday shuttles are not valid for receptions shuttles and vice-versa. A separate ticket is required. Angela Biederman, Rachel Bigley, Eric Broz, Hannah Cameron, Ivan Carmona, Andrew Castaneda, Sara Catapano, Trisha Coates, Nicholas Danielson, Andrea Denniston, Louise Deroualle, Jonathan Farrell, Stuart Gair, Michael Gesiakowski, Margaret Gormley, William Harning, Sarah Heitmeyer, Hiromi Iyoda, Wansoo Kim, Patrick Kingshill, Ellen Kleckner, Michelle Laxalt, Wen-Dan Lin, Candice Methe, James Mitschmyer, Sara Morales-Morgan, Abby Nohai, Brent Pafford, Anthony Pearson, Jason Piccoli, Tonya Shanholtz, Mitchell Spain, Scott Steder, Kelly Stevenson, Michael Ware, Christina Warzecha, Austin Wieland. Hours during NCECA: Sun-Tue 12-6pm; Wed 10am-6pm; Thu-Sat 12pm – 6pm; Thu 3/26 hours extended to 9:30pm (daily hours extended until 8 with RISD ID) Reception: Thu, Mar 26, 6-8pm. Mar 21-Apr 9. John Oles, Seth Rainville, and Susan Schultz. Featuring works in porcelain from three distinctly different Ceramists, Porcelain in Three explores the reaches of the elusive material (Sculpture, Vessels, Narrative). Organized by Seth Rainville and Kimberly Charles. Hours during NCECA: Tue 11am-6pm; Wed 10am- 6pm; Thu-Sat 11am-6pm; Thu hours extended to 9:30pm. Reception: Thu, Mar 26, 5-9:30pm. Mar 7-28. RISD students, residency alums, faculty, and faculty alums. Multiple exhibitions of RISD students, residency alums, faculty, and faculty alums. Organized by Katy Schimert and Lawrence Bush. Hours during NCECA: Tue by appt; Wed 10am-7pm; Thu & Fri 10am-8pm; Sat 10am-2pm; Thu hours extended to 9:30pm. Reception: Thu, Mar 26, 5-7pm. Mar 24-28. Jim Melchert, Jim Shrosbree, Janet Koplos, Glenn Adamson, and others. Gallery as participatory lab exploring conceptual practice as object, image, process; materializing, dematerializing, re- materializing, using recent work by defining Conceptual artist Jim Melchert. Curated by Paul Kotula. preview for collectors by appt Mar 24. 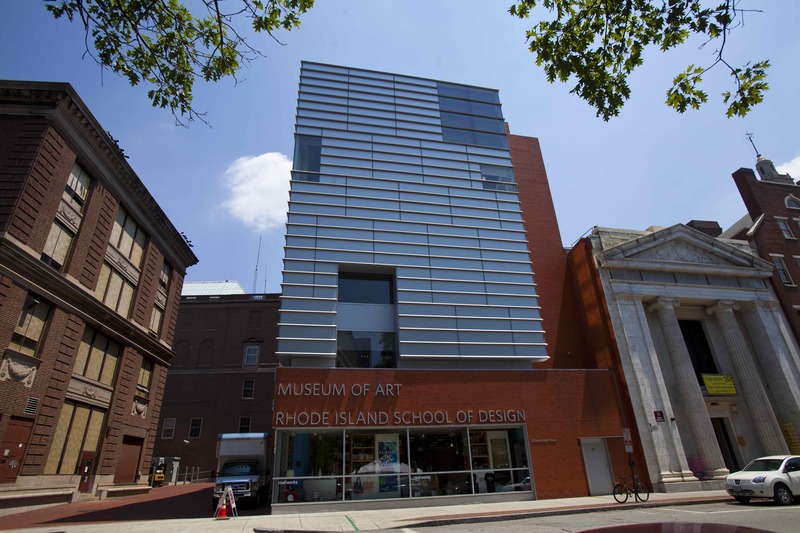 RISD Museum: Ceramics Free admission w/ NCECA badge, Ancient, Chinese, Japanese, European 16th-20st centuries, American 18th-21st centuries, Chinese exportware. Ceramics of all eras and cultures can be found throughout the Museum. Of particular note are the Porcelain Gallery and the Farago Bridge Gallery, and Granoff Modern and Contemporary Galleries. Curated by Elizabeth Williams, Curator of Decorative Arts and Design. Hours during NCECA: Sun 10am-5pm; Tue-Sat 10am-5pm; Thu hours extended to 9pm. Special free lecture: Meredith Chilton is speaking “Porcelain Wars: The Rivalry Between Meissen and Du Paquier”, Metcalf Auditorium, Thu, Mar 26 2pm. Ongoing. Kelli Rae Adams, Nathan Craven, Dawn Holder, Courtney Leonard, Rebecca Manson, Casey Mcdonough, Allison Valchuis, Fonda Yoshimoto and Dear Human. Support systems, structural systems, systems of order, systems of control, social systems, breakdown of systems, systems that arise in chaos; all are relevant in our investigations. RISD alumni exhibition. Curated by Sarah Gross, Jess Riva Cooper, and Angela Carbone. .
Kirk Mangus – Things Love/Love Things, Kirk Mangus. This is an exhibition of the compelling gestural and figurative work in clay and on paper by Kirk Mangus, one of RISD’s distinguished alumnus. Curated by Eva Kwong. Hours during NCECA: Wed 10am-7pm; Thu & Fri 10am-8pm; Sat 10am-2pm; Thu hours extended to 9:30pm. Reception: Thu, Mar 26, 5-7pm. Mar 25-28; preview for collectors by appt Mar 24. Paul Scott & Andrew Raftery: Transferware, Paul Scott and Andrew Raftery. An exhibition of new work rising from transferware’s rich history of image and meaning. Organized by Andrew Raftery. Hours during NCECA: Wed 10am-7pm; Thu & Fri 10am-8pm; Sat 10am-2pm; Thu hours extended to 9:30pm. Reception: Thu, Mar 26, 5-9:30pm. Mar 25-28; preview for collectors by appt Mar 24. 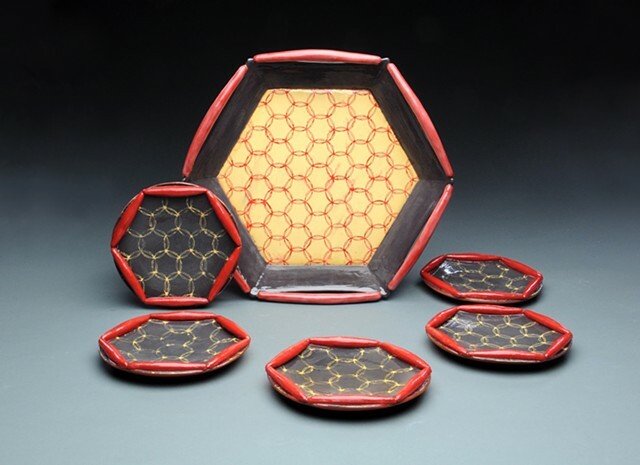 Working with the Schein-Joseph Museum of Ceramic Art at Alfred University, the Providence Art Club will present exciting and important works from the oeuvre of Val Cushing (1931-2013), a longtime Alfred Ceramics Professor and leader in the field. 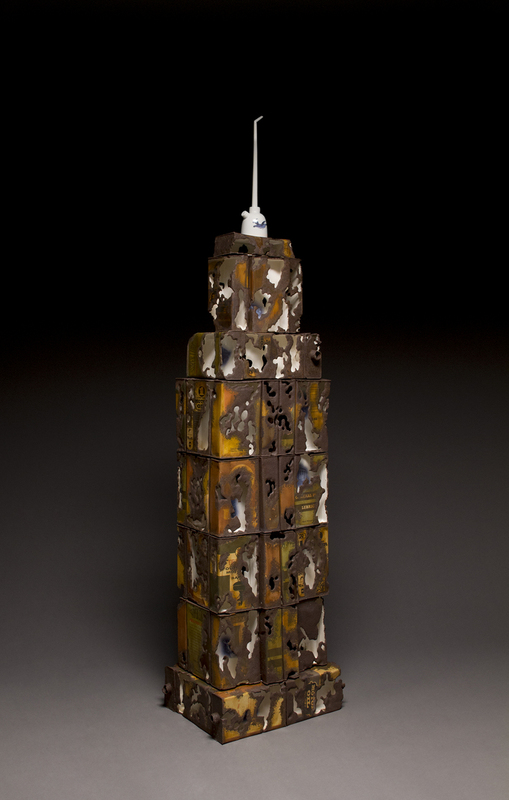 Selected work dates from 1959 to his final kiln in 2013. 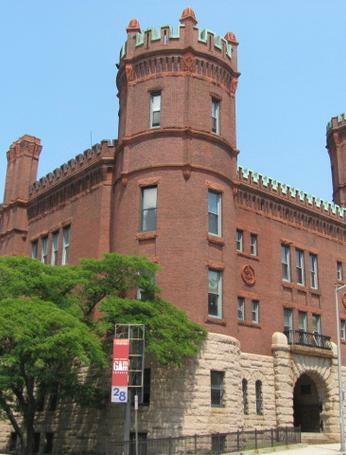 Curated by Providence Art Club in conjunction with Susan Kowalczyk, S-JIMCA, Alfred University. Hours during NCECA: Sun 2-4pm; Mon & Tue 12- 4pm; Wed 10am-5:30pm; Thu & Fri 12-4pm; Sat 2-4pm. Mar 22-28. Closed for Reception shuttle. Juried by Linda Christianson, Minnesota studio potter, Jo-Ann Conklin, Director, David Winton Bell Gallery, and Anders Ruhwald, Head of Ceramics, Cranbrook Academy of Art. Ivan Albreht, Jeremy Ayers, Vlad Basarab, Zimra Beiner, Jeremy Brooks, Ling Chun, Joshua Clark, Donna Cole, Ned Day, Jessika Edgar, Phillip Finder, Sean Michael Gallagher, Misty Gamble, Nancy Green, Craig Hartenberger, Karin Karinson Nilsson, Lauren Karle. Produced by NCECA, the NCECA Biennial is a premier international juried ceramics exhibition featuring 51 works by 49 artists from across the United States and 5 other countries. Ann Agee, Sana Musasama, Annabeth Rosen, Sally Saul, Arlene Shechet and Andrew Molleur and Arnie Zimmerman. An exhibition that brings together ceramic sculptures that use the human form to reference a broad scope of genres including social injustice, landscape, decorative arts and the utilitarian object. Curated by Cade Tompkins Projects. Hours during NCECA: Wed-Sat 10am-6pm; Thu hours extended to 9:30pm. Reception: Thu, Mar 26, 6-8pm. Mar 21-Apr 25. Kate Blacklock, Jonathan Bonner, Chris Gustin, Jane Masters, Andrew Raftery, Tayo Heuser. An exhibition of sculpture by 6 mid-career artists experimenting with the process of 3D ceramic printing as an extension of their studio practice. 3D printing provided by 3D Systems. Organized by Kate Blacklock. Hours during NCECA: Sun 2-4pm;Tue 11am-4pm, Wed 10-5:30 Thu-Sat 11am-4pm; Thu hours extended to 9:30pm. Reception: Thu, Mar 26, 5-930pm. Mar 19-April 3. Kim Dickey, Chase Folsom, Del Harrow, Ashley Jonas, Joanna Powell, Antje Scharfe. Still Lifes: The Potential of the Picturesque, still life’s created by six different artists. 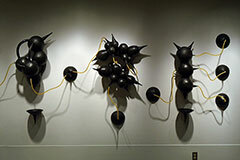 These arrangements contemplate how the juxtapositions of objects can become a lively experiment concerned with connectivity. Organized by Chase Folsom and Ashley Jonas. Hours during NCECA: Sun 1-4pm; Mon& Tue 8am- 4pm; Wed 8am-5:30pm; Thu 8am-9:30pm; Fri 8am-4pm; Sat 1-4pm. Reception: Thu Mar 26th 5-9:30pm. Mar 9-28. Tomoko Abe, Ben Anderson, Linda Casbon, Susan Crowell, Linda Huey, Leigh Taylor Mickelson, Kathy Ruttenberg, Erik Wilhelmsen, Arnie Zimmerman. 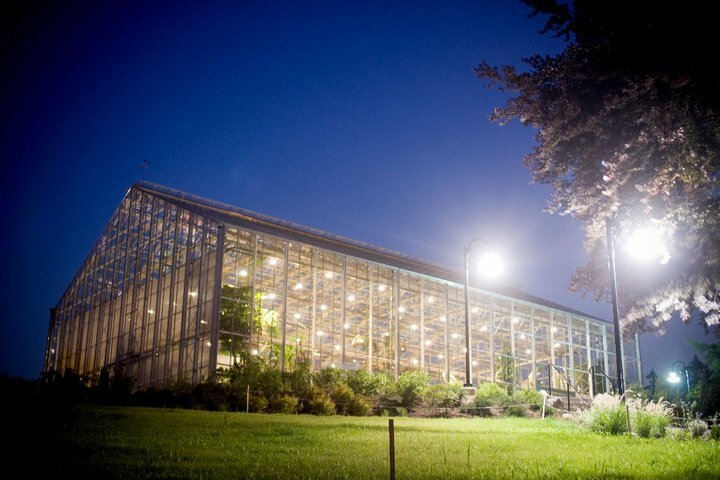 An exhibition of large scale and site specific sculpture installed in the glass conservatories of the Roger Williams Park Botanical Center. Curated by Kate Blacklock. Hours during NCECA: Sun-Sat 10am-5:30pm; Mon closed; Friday hours extended to 7:30pm. $5.00 admission; Free with conference badges. Reception: Fri, Mar 27, 4:30-7:30pm. Mar 12-29. Bowls, posters, t-shirts, posters and more all created by hundreds of artists, professional and amateur. 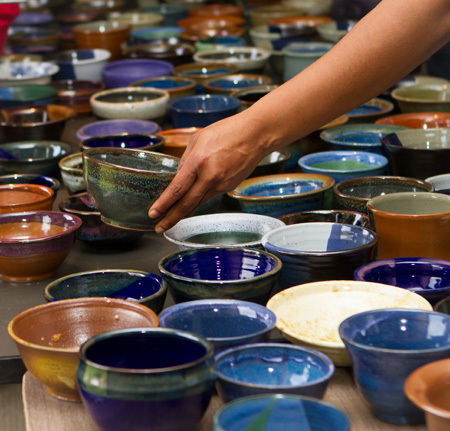 The origins, extraordinary events and amazing stories of The Empty Bowls Project, whereby craftspeople have raised tens of millions of dollars for groups working to fight hunger. Organized by Lisa Blackburn and John Hartom. Hours during NCECA: Tue-Sat 10am-5pm. (Wed 3/25 hours extended to 5:30). Mar 24-Jul 2. Paul Donnelly, Rain Harris, Chandra Debuse, Tommy Frank, Meredith Host, Alex Watson. Artistic Intersections will explore works that are used for art of dining. Participating artists will work collaboratively to create singular works that are evocative of both of their voices. Organized by Paul Donnelly. Hours during NCECA: Wed 10am-6pm; Thu-Sat 12-6pm; Thu hours extended to 9:30pm. Reception: Fri, Mar 27, 5-9:30pm. Mar 5-28. Jeannie Hulen. Circumventing overburdened themes such as “environmentalism,” in favor of a non- linear, fantastical position. I call attention to relationships in the natural world, including intellectual, psychological, and numinous facets of symbiosis. Organized by Jeannie Hulen. Hours during NCECA: Wed-Sat 9am-6pm; Fri hours extended to 9:30pm. Reception: Fri, Mar 27, 6-9pm. Mar 25-May 2. Matt Wilt. Mixed media assemblage sculpture. Curated by Robert P Stack. Hours during NCECA: Sun, 12-5pm, Mon-Tue closed; Wed 10am-5:30pm; Thu & Fri 3-8pm; Sat 12-5pm; Fri hours extended to 9:30pm. Reception: Fri, Mar 27, 6-9pm. Mar 24-Apr 19. Sarah Hess, Sam Kashuk, Jason Pacheco, Lawrence Timmins, Kayla Vallone. Works by winners of the Harriet Brisson Award for Excellence in Ceramics showcase Rhode Island College’s talented alumni. The award honors Professor Emeritus Harriet Brisson who retired in 1997. Curated by Craig Bachman and Juan Jose Barboza-Gubo. Hours during NCECA: Mon-Thu 10am-5:30pm; Fri 10am-9:30pm. Reception: Fri, Mar 27, 5-9:30pm. Mar 3-27. Emily Duke, Brian Kakas, Yiu Keung Lee, Sarah Lindley, Blake Williams. Sculptural ceramics by five early to mid-career Michigan artists highlight current directions in the free use of clay, celebrating the medium’s potential for experimentation and recent expressive innovation. Curated by Diana Pancioli. Hours during NCECA: Tue-Thu 12-8pm, Fri 12-9:30pm; Wed open at 10am. Reception: Fri, Mar 27, 5-9:30pm. Mar 3-28. Maker’s Studio turns the gallery into the studio laboratory of a group of artists whose experimental ceramics projects stretch the boundaries of clay as both contemporary craft and technological resource. Curated by Jaimianne Amicucci. Hours during NCECA: Tue 6-8pm; Wed 10:30 -8pm; Thu-Sat 12-6pm; Fri hours extended to 9:30pm. Reception: Fri, Mar 27, 5-9:30pm. Mar 11-28. Allan Rosenbaum. Binary is an exhibition negotiating the territory between drawing and sculpture, in which wall-mounted epoxy clay sculptures with clearly demarcated modalities of execution are used to generate ephemeral “shadow drawings.” Organized by Allan Rosenbaum. Hours during NCECA: Wed-Sat 10am-6pm; Fri hours extended to 9:30pm. Reception: Fri, Mar 27, 5-9:30pm. Mar 25-28. David Allyn, Nidal Fakhouri, Shannon Wallack , Nicole Aquillano, Chris Tonsgard , Dustin Yager. A survey of utilitarian ware by ceramic artists living and working in the providence area, with a focus on hard lines and graphic design. Curated by Candita Clayton. Hours during NCECA: Sun-Sat 10am-7pm; Fri hours extended to 9:30pm. Reception: Fri, Mar 27, 6-9pm. Mar 22-29. Kerry Adams, Heidi Born, Lauren Fisher, Stef Grant, Jungil Hong, Anna Shapiro, Meredith Stern, Kik Williams, Joan Wyand, Meredith Younger. Untamed Objects is a group show of contemporary female ceramicists whose work explores challenging social and environmental issues. 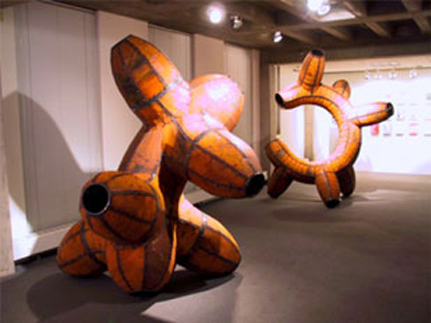 The works are a variety of installations, sculptures, and functional items. Organized by Joan Wyand. Hours during NCECA: Wed 10am-5:30pm, Thu 5-7pm; Fri 5-9:30pm; Sat 7pm-1am. Reception: Sat, Mar 28, 7pm-1am; dance party at 10pm with local DJs. Mar 25-Apr 24. No reception Friday night but open for shuttles. Ivan Albreht, Nel Bannier, Daniel Bare, Alfredo Eandrade, Khurtova / Bourlanges, Shida Kuo, Anthony Merino, Melissa Stern, Madeline Stillwell. In Cognitive Dissonance, the artists affirm that imperfection is not only essential but in some ways glorious. As such, the lively experiment started in Rhode Island, continues today and perpetually. Organized by Nel Bannier and Anthony Merino. Mar 25-28. Frederick Bartolovic, Casey McDonough , Robin Strangfeld, Blake Jamison Williams, Lauren Herzak-Bauman and Kimberly Ellen Greene. During a Red Lodge residency, The Romantic Robots mapped a two-year collaborative experiment. On exhibition are the artifacts of collaboration, thirty lines of seven objects each, 210 objects total. Organized by Kimberly Ellen Greene. Mar 25-28. CE Dot. Dot. Dot., Andrew Gilliatt, Chris Pickett, Emily Free Wilson, Jana Evans, Martha Grover, Meredith Host, Paul Donnelly & Rain Harris, Sunshine Cobb. Nine artists using dots in their work – examining the ways a simple dot can be incorporated in pottery, taking this very simple element and using it to express many ideas. Organized by Martha Grover. Mar 25-28. Silvie Granatelli, Jerilyn Virden, Ian Anderson, Mark Hewitt, Daniel Johnston, Simon Levin, Lucie Brisson, Kenyon Hansen, Mark Shapiro, Michael McCarthy. A survey of work exploring individual voice, studio style, and connection among professional studio artists and apprentices with features of several prominent lines of studios and apprentices. Organized by Mark Shapiro. Mar 25-28. Matt Mitros. A unique visual workout targeting one’s expectations on the subjects of Architecture and Nature as seen through the lens of popular culture. Organized by Matt Mitros. Mar 25-28. Naomi Cleary, Rain Harris, Rebecca Harvey, Meredith Host, Janet Macpherson, Kyla Toomey. To Be Determined includes along with finished pieces, some of the tools and tests developed by these process-oriented artists as both a complement and an explanation to process-driven work. Organized by Rebecca Harvey. Mar 25-28. Hours during NCECA: Wed 9am-5:30pm; Thu 9am-5:30pm; Fri 9am-9:30pm; Sat 9am-5pm. Reception: Fri, Mar 27, 5-9:30pm. K-12 Students. Collection of ceramic work representing public, private and after school programs throughout Rhode Island. Organized by Tricia Barry, Kerri Sloat and Norv Garnett, owner Mad Dog Artist Studios. Hours during NCECA: Mon & Tue 6-8pm; Wed 10am-8pm, Thu-Fri 11am-8pm; Sat 10am- 12pm; Fri hours extended to 9:30pm. Reception: Fri, Mar 27, 5-9:30pm. Mar 23-28. Stay tuned to the blog for more information! And as always, feel free to post any questions on your mind here, and I’ll answer them! Where are the maps? It is apparent that they exist, but you have not published them to either the blog or the website. The page for interactive maps on the website says “coming soon” and has for quite some time. We are less than two weeks from conference. It would be great if we could see them and make plans based on them before we get to Providence. I did not include maps in this blog post because it is *technically* about shuttles. My experiences is that people who chose to drive on their own tend to plan a route which might be different than any one single shuttle or tour…often it’s a combination of stops from several shuttles. In this situation, I tend to find Google maps to be the best tool there is for this. I have done this many times before, spending hours mapping out the same routes and galleries on Google maps as I then see in my packet (courtesy of Ceramics Monthly, I believe) when I get to the conference. It would be such a joy to have these published in advance on the website, saving some of us those untold hours. Those of us who drive would be able to map out our desired routes so quickly and easily in advance. I seem to remember that one year CM actually mailed out the insert early to members or subscribers and it was so wonderful! Hmm. I see your point. But i wonder if a map or just the addresses of the locations would be most helpful? The addresses of the locations are already in the exhibition descriptions, hence the ability to map them out on Google maps. But it takes hours and hours to do, if you want to get a head start on planning, especially before arriving at a city which is unfamiliar. The maps already have all those locations pinned, making it easy to highlight the ones you want to see in each shuttle route and then figuring out the routes. Let me be clearer….I am not referencing just plain maps, but the ones prepared for the conference with the exhibitions marked on them. Thank you so much, Cindy. This is actually an immense help, and if the maps for the shuttle routes are available to post on line, that would be a dream come true. Then all the work of pinning the exhibitions to the map via Google maps is already done, saving hours of work for those of us who like to plan in advance of getting the maps in our packets. If you like, Tell me when to find you at conference and I will show you just what I (and others who drive) do and why it is so helpful.